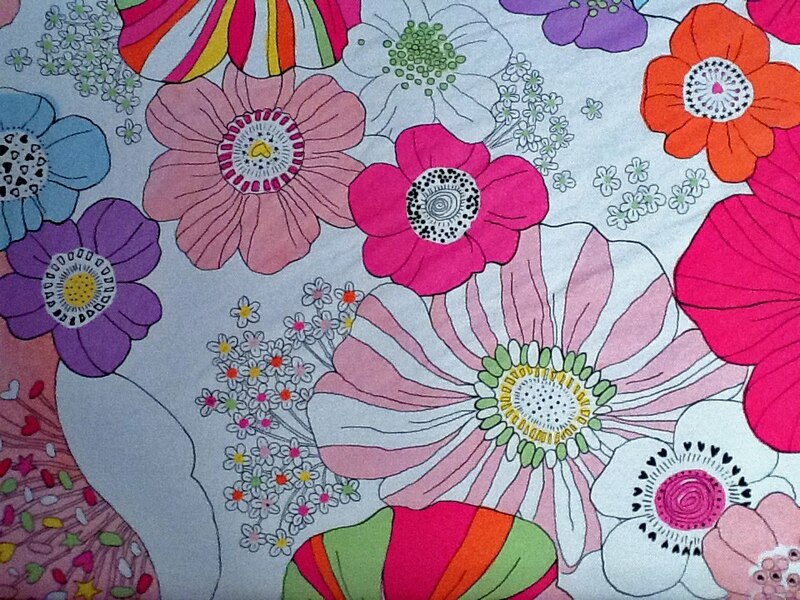 I thought I would share with you the amazing pattern of the sheets that we got for the baby’s nursery. I think the print is wonderful with the interesting flowers, but mostly it was the colors in the sheets that I loved – the purple, orange, bright pink, hint of baby blue, dash of green – just perfect! This sheet was the jumping off point for decorating the nursery, so I have incorporated some of these colors throughout other parts of the room, too. Don’t worry, I will give you the full nursery room makeover tour soon enough! 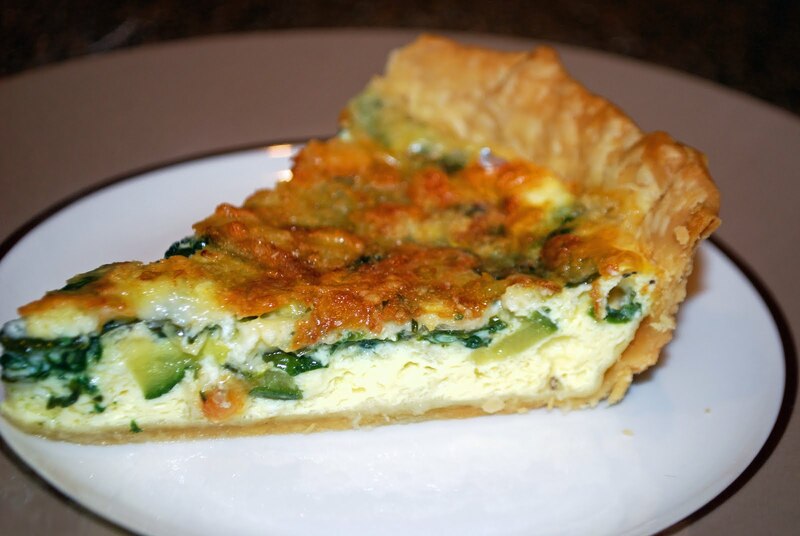 A delicious quiche was served at my baby shower brunch last weekend and I couldn’t stop thinking about it all week…so we decided to make one for breakfast this morning. It came out so great I had to share the recipe! Melt butter in heavy medium skillet over medium-high heat. Add shallot, zucchini, and garlic, sauté until softened, about 8 minutes. Add spinach and stir until spinach is wilted, about 3 minutes. Cool slightly. Preheat oven to 375°F. Dust 1 side of crust with flour. Transfer to 9-inch-diameter quiche dish or pie pan, floured side down. Press into pan, sealing any cracks. Trim edges. Sprinkle both cheeses over bottom of crust. Top with cooled spinach mixture. Beat eggs, milk, salt, and pepper, in large bowl to blend. Pour over spinach. Bake until filling is set, about 50 minutes. Cool slightly. Cut into wedges and serve. 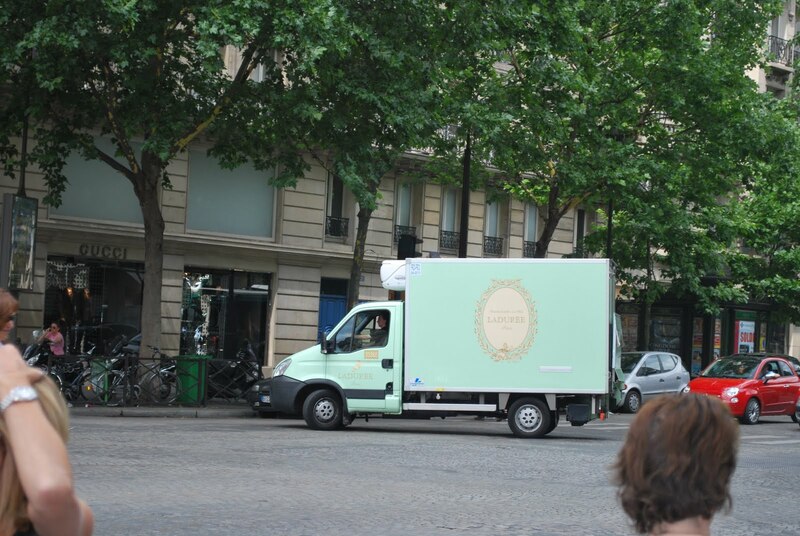 The second best part of my honeymoon in France (first was the romance of it all, of course) was the fact that there was a Laduree patisserie around every corner in Paris where fresh, delicious macarons (different than our American macaroons) were sold. Crisp on the outside, sweet and chewy on the inside – just the most delightful treat! They come in tons of different flavors like raspberry, madagascar chocolate, rose, and vanilla. And can I also mention their packaging is just beautiful – look at this box! 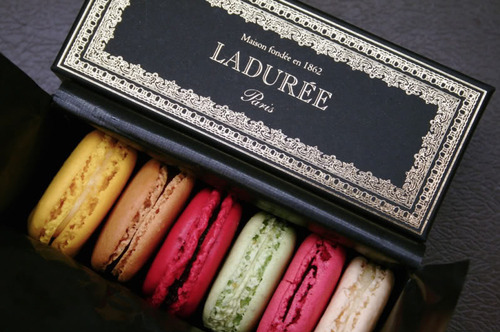 Well, you don’t have to travel to Paris to fulfill your Laduree cravings anymore…they have just crossed the Atlantic and opened their first US cafe in NYC. Click here to view a short and sweet interview with company chairman David Holder about the new shop. Thanks to everyone who came to my baby shower today and thanks to my mom, sister, and niece for hosting – what a lovely afternoon!! 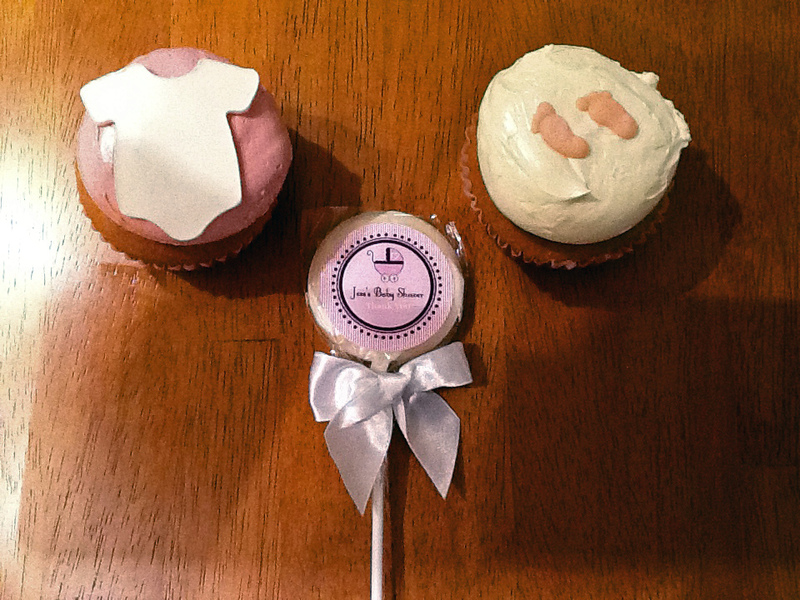 And check out these treats…nothing is better than an adorable cupcake and a sweet shower favor (it’s a lollipop)! We made our first “fall” recipe the other night for dinner when it was a little cool out. And by “we” I mean my husband made it while I was out at a prenatal yoga class. This recipe is just great with the crisp apples, that have a sweetness from the brown sugar and a tartness from the vinegar. And it’s served over delicious and creamy polenta – so good. Heat the oil in a large skillet over medium-high heat. Season the pork with ½ teaspoon each salt and pepper and cook until browned and cooked through, 7 to 9 minutes per side. Transfer to a plate and tent with foil to keep warm; reserve the skillet. Add the apples and onion to the drippings in the skillet and cook over medium-high heat, tossing frequently, until slightly softened, 6 to 8 minutes. Add the broth, vinegar, and sugar and cook, tossing occasionally, until thickened, 3 to 4 minutes. Add 1 tablespoon of the butter. Return the pork chops to the skillet and cook until warmed through, 1 to 2 minutes. Meanwhile, in a medium saucepan, bring 2 cups of water to a boil. Whisk in the polenta and cook, whisking, until thickened, 3 to 4 minutes. Whisk in the remaining tablespoon of butter, ½ teaspoon salt, and ⅛ teaspoon pepper. 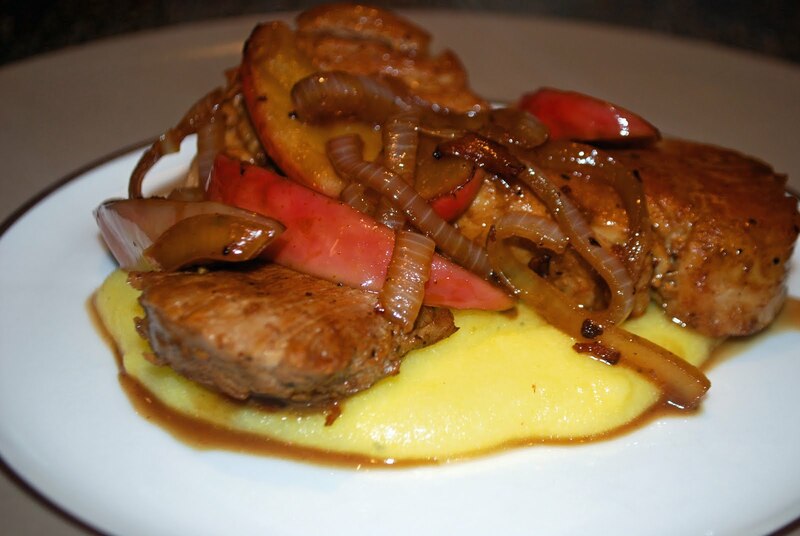 Top the polenta with the pork chops and apple mixture. Is everyone excited for New York Fashion Week to view Spring, 2012 collections? I am. Today was Day 3 of runway shows, so I thought I would share with you again the best website for Fashion Week coverage – click here. You can see still photos of shows, watch the recorded video, or a live stream of some choice shows, which is my favorite feature of the site! Don’t you love this polka-dot skirt by Pink Tartan? I am glad to see polka dots will still be “in” in the Spring. I also love these green pants from Luca Luca, what a dynamic color! 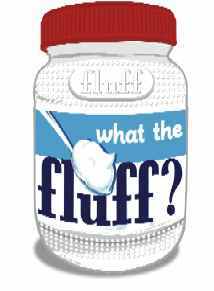 Are you a fan of Marshmallow Fluff? Does it remind you of childhood memories of having the perfect combination of a Fluffernutter, do you dream about it swirled into Nutella for a delectable, chocolate, “fluffy” delight? If you said ‘yes’ then you are in luck! On September 24th, Union Square Main Streets is holding their Sixth Annual “What the Fluff” festival to honor the creamy delight. They’ll have food, games, entertainment, even a celebrity appearance by Susan Olsen, or ‘Cindy’, from the Brady Bunch. And there’s still time to enter the Fluff cooking contest,which boasts some top prizes, including a tour of the factory (a rare treat)! 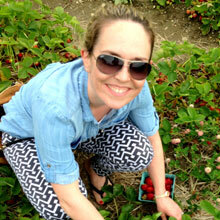 To celebrate the local blog, Wicked Good Travel & Activities, is holding a giveaway contest. Just go over to Wicked Good Travel & Activities between August 31st and September 12th and leave a brief comment here in the form of creative recipes, prose, poetry, and more- all expressing your love for Marshmallow Fluff. Three winners will be chosen, so give us your best! 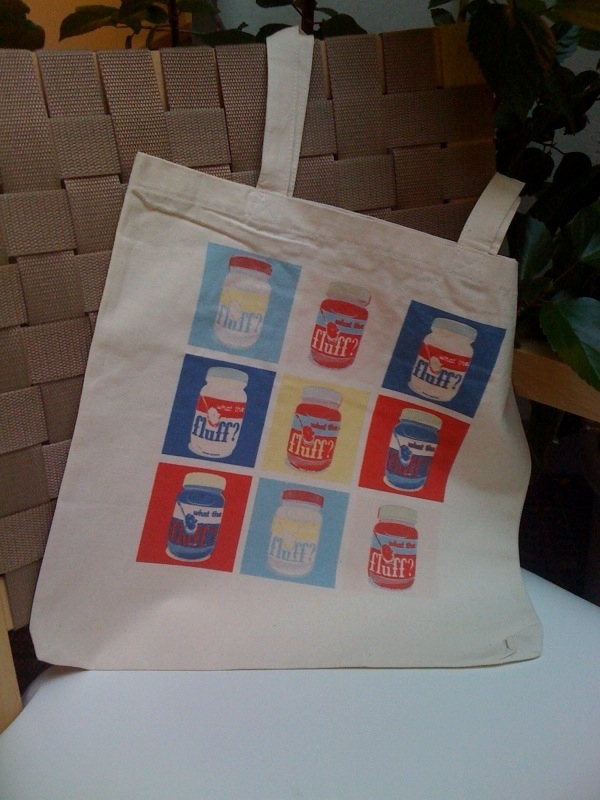 One will receive a Fluff tote bag and the other one will receive two free studio class at The Training Room. All winners will also be featured on Wicked Good Travel & Activities, Somerville Patch, and Union Square Main Streets. So, what the fluff are you waiting for? Enter the contest and SHOW US YOUR FLUFF!